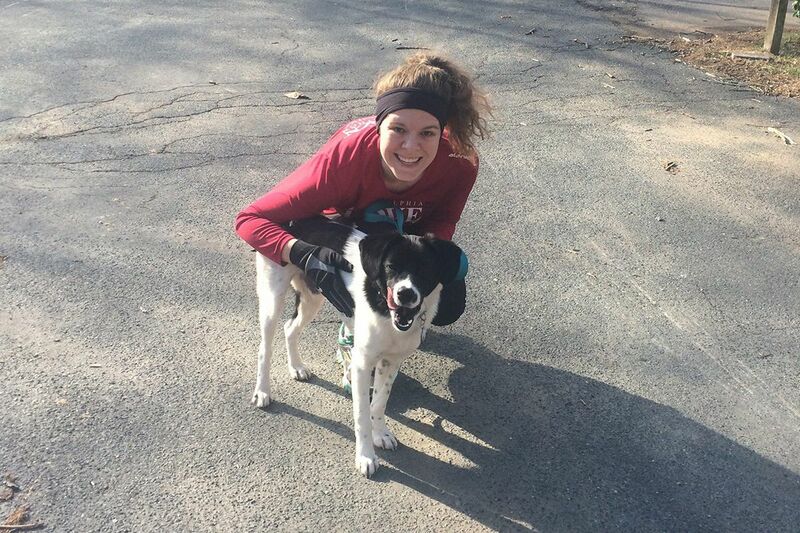 Meghan Blickman, here with her dog Buddy, lost her job, but with the help of a Special Enrollment Period and a skilled navigator, she found good health insurance on the Affordable Care Act marketplace. When she was the training director for a nonprofit that helps educate people about their health coverage options, Meghan Blickman's own insurance was covered by her employer. So when her job with Enroll America ended last month, one of her first priorities was finding new insurance that she could afford, but that would also cover her needs. "I'm not an expert in health care and it's complicated, so I sought out an expert," said Blickman, 29, from Point Breeze. Two days after contacting a health-care advocate, Health Federation of Philadelphia, by phone, she met with a navigator, and together they filled out her Marketplace application, at no charge to Blickman. Now, with premium credits, she has a plan that costs her about $225 a month. "Hopefully, this will be a temporary thing, but the idea of going without health insurance, even to save money, is not an option for me. Having health insurance is the law of the land, and I take that seriously." The national debate about "repealing and replacing" the Affordable Care Act is causing confusion, uncertainty, and misinformation, though even if Congress does agree to changes, they would not affect 2017 policies. President Trump has suggested he will let Obamacare, as the ACA often is known, fail. And even if Congress does nothing, his administration can cut participation in the program, through such steps as shortening enrollment periods, tightening enrollment rules, and ending consumer outreach. But the ACA is still the law. And if, like Blickman, your life has changed recently in a way that affects your health insurance coverage, it may offer you access to needed coverage, provided you follow the rules (more on that later). But not everyone knows about special enrollment periods, or understands why it's critical to act quickly. "People call us every time there's a headline in the newspaper and say, 'Oh no, I just lost coverage,' " said Antoinette Kraus, executive director of the Pennsylvania Health Access Network, a statewide advocacy coalition that runs a helpline (877-570-3642) for people seeking services. "Folks don't know when the Special Enrollment Period is, if the ACA still exists, if they're eligible or if it's even worth it." A typical comment Kraus has been hearing as politicians debate various overhaul schemes: "If this passes I won't have health insurance in a couple months anyway, so why bother?' "
Hilary Young and her 2-year-old daughter, Sadie, share time on their outdoor swing. But as Hilary Young knows, the need for medical care is unpredictable. That's why she insisted on getting a basic insurance plan that cost her $300 a month back in 2011 when she moved to Philadelphia from New York to be with her boyfriend. "I was barely making enough money to cover that and had to dip into my savings," recalled the Queen Village woman. But a few years before her move, she needed emergency surgery for a painful ovarian cyst, and knew she wouldn't risk being uninsured. "It could bankrupt you or put you into debt when you're starting out in your life and career," said Young, who is relieved to now be on her husband's employer plan. Kraus said she fears that more people may risk going without insurance both because of the overall "repeal and replace" debate, and because of two specific revisions the Trump administration made in the ACA. The first, cutting the open enrollment period for coverage in 2018 in half from what it was in the past. So this year, consumers have only from Nov. 1 to Dec. 15 to purchase coverage for next year if you don't qualify for a special enrollment period. The second revision is aimed at those special periods. "To be able to enroll in a plan, you have to provide documentation that you are indeed eligible," Kraus said. It used to be that you could choose a plan and enroll first, and submit documentation about your job loss or divorce or marriage later. When eligibility changes were made during the Obama administration, there was a 20 percent reduction in enrollment around those life changes, according to Kraus. "This is tightening it up even further, so we can expect the reduction will go down at least that amount, if not even further," she said. Another reason to act quickly: Most people need expert guidance to make this complicated purchase, and finding the right help can take time. About a year ago, when Jody Applebaum's divorce was finalized, she needed to find her own insurance plan. A self-employed musician on a low income, she went to the Marketplace website and found that "most of the plans were way above what I could afford," she recalled. "I was frustrated because time was running out and it was very difficult to speak with anybody on the Marketplace phone lines. I was sitting and waiting forever." More troubling was the fact that none of the plans she found covers a costly injectable drug she relies on for knee pain from osteoarthritis. "They may not deny you coverage, but they certainly are limiting your access to the things that would make you feel better," said Applebaum, 59, of Queen Village. Blickman said she has had to rearrange her budget to afford her $225-a-month share of the premiums, but believes that the cost is reasonable for what she's getting. She didn't even try to figure out the program herself, preferring to rely on an in-person meeting with a navigator. You can find navigators, agents, and brokers near you by going to the HealthCare.gov site and clicking on the "Find Local Help" link at the bottom of the home page. Her navigator helped her compare available plans, and understand her tax credit eligibility. "She provided me a lot of clarity between the metal levels: bronze, platinum, and silver," Blickman said, referring to how plans are ranked according to how much coverage they provide. "Ones that you would think were better might not actually be the best for you." Blickman also wanted to ensure that her antidepressant medication would be covered, so the navigator helped to call the insurer and confirm that they were.